1. You can factorize ab out of the numerator and then cancel, i.e. 2. 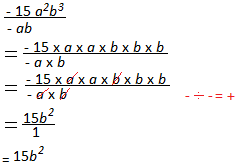 You can split the quotients into 2 parts before simplifying, i.e.